Bronze is the mirror of the face, wine of the mind. From Latin, Mons ferratus Montferrat is part of the region of Piedmont in Northern Italy. Its name in Italian, Il Monferrato, is derived from different origins: Monx Ferrax, fertile mountain; Mun Fra, iron mountain; Mons Ferratus, mountain cultivated with spelt. It been said that towards the 1900’s, the mother and father of Aleramo of Montferrat came to Italy and travelled directly to Rome to fulfil a vow. Once they arrived in Sezzadio, near Acqui Terme, the woman gave birth to a boy who was given the name Aleramo, meaning “cheerful person.” Soon after the parents died the child was entrusted to the local nobles and to a Saxon nursemaid. Aleramo was raised in Sezzadio. The precise historical date of Montferrat dates back to March 21st, 967 when Roman Emperor Otto I handed over all the land ranging from the River Tanaro, the River Orba and to the Ligurian shores of the sea. The Marquess was then in possession of the descendants of Aleramo : the Aleramici dynasty (second half of 1000 -1305), the Palaeologus dynasty (1306–1533) and the Gonzaga dynasty (1563-1708). The House of Savoy came into complete possession of Montferrat in 1708 when the duchy of Mantua was occupied by the Imperial troops of the Roman Emperor, Leopold I. Wine has always been made in Piedmont. Viticulture was probably already practiced in the 6th Century by the Celto-Ligurian population and then, under Roman names, the vines spread along the most important roads. Its territory, almost exclusively consisting of a hilly nature, lies mainly in the provinces of Asti and Alessandria and extends towards the south starting from the right bank of River Po to the Ligurian Apennines on the border with Genoa and Savona. 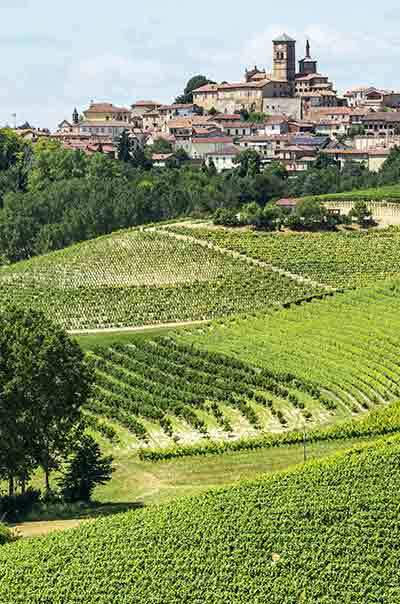 On the 22nd of June, 2014, during the 38th session of the UNESCO Committee in Doha, Piedmont’s Infernot, Barbera and Asti Spumante were officially granted World Heritage status along with Langhe and Roero.